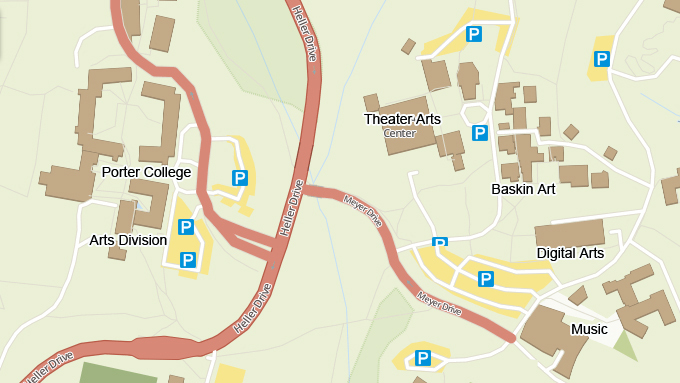 The UCSC Theater Arts Center, the Music Center, the Digital Arts Research Center (DARC), and Baskin Visual Arts are located around the Arts parking lot (#126) on Meyer Drive. Plan for a 15-30 minute drive from downtown Santa Cruz via High Street or Bay Street. The Communications Building, home to the Film and Digital Media Department's Studio C, is located on McLaughlin Drive, next to the Engineering Building near the Core West Parking Structure. 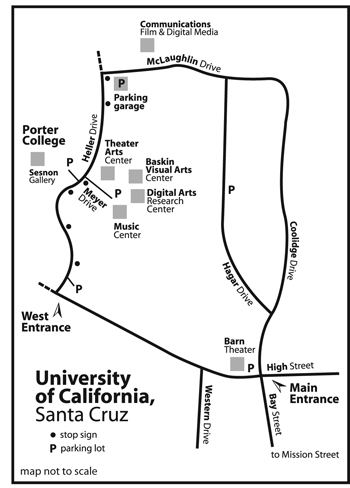 The Mary Porter Sesnon Art Gallery is located at Porter College on the UC Santa Cruz campus (served by the Porter College parking lot and the Arts parking lot on Meyer Drive. - From the intersection of Bay / High streets, proceed northwest on High Street (becomes Empire Grade Road) for approximately 1 mile. - At the stop light, turn RIGHT onto Heller Drive at the West Entrance of UCSC. - Proceed up the hill. - Immediately after the 4th stop sign, turn RIGHT onto Meyer Drive. - Parking lot entrance is at the next stop sign. The Theater Arts Center and the Baskin Visual Arts Center are a short walk uphill from the parking lot. The Music Center and the Digital Arts Research Center are at the south end of the lot. - Shortly after the 3rd stop sign, turn left onto Porter-Kresge Road entrance (right lane). - Gallery is located on the 2nd Floor. Elevator access available. - Proceed up the hill on Heller to the Core West Parking Structure. - The Communications Bldg is a short walk. There are close-in spaces at the Communications Bldg. for vehicles displaying handicap parking placards. Accessible parking for Theater Arts and Baskin Visual Arts is available along Kerr Road near the traffic circle between Baskin Arts and the Theater. Accessible parking for the Recital Hall and the Digital Arts Research Center is available in the Arts parking lot. Visitors with DMV placards or plates may park for free in DMV spaces, marked "Medical" spaces, metered spaces or stalls without additional payment, or in time zones (e.g., 10-, 15-, or 20-minute spaces) for longer than the posted time. DMV placards are not valid in spaces reserved for departments, individuals, contractors, carpools, vanpools, or in lots solely designated for “C” permit holders. UCSC requires a parking permit for nearly all parking lots. See UCSC Transportation and Parking Services site for current information about Arts Lot 126. Many parking lots have metered spaces (coin operated) or numbered spaces (purchase permit from dispensing machines). Transit District buses and campus shuttles stop on Heller Drive about two “blocks” from the Music, Theater Arts, Digital Arts, and Visual Arts facilities. (Stop at the Porter College/Rachel Carson College bus stop and walk to our facilities via staircase and walking paths. Path is NOT wheelchair accessible!) Busses stop a short distance from the Communications Bldg. ALLOW YOURSELF ADEQUATE TIME: If you arrive later than 15 minutes before curtain, we cannot guarantee that you will see the first portion of the program. Please allow at least 30 minutes to park, purchase a parking permit, pick up your tickets (if applicable), and be seated before the performance is set to begin.